Thanksgiving is about friends, family, and, of course, food. Over there years, a few dishes have become November classics, including not only turkey, but also stuffing, cranberry sauce, green bean casserole, and so on. If you do it right, the traditional Thanksgiving spread can be delicious, but it also requires a lot of time and effort. If you’re hosting this year, maybe it’s time to consider another tradition: pizza. 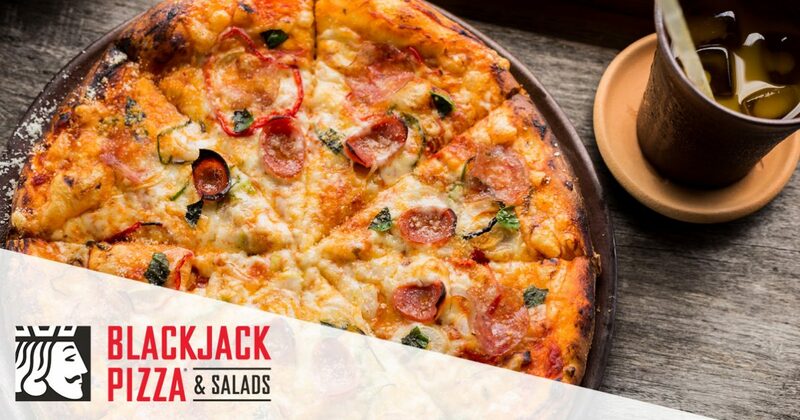 Keep reading to learn why you should make BlackJack pizza a new Thanksgiving favorite and sign up for our e-club today for special discounts and coupons! 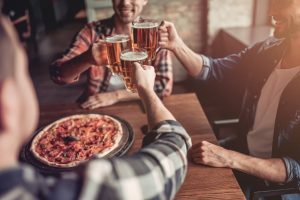 If it’s your turn to host your family and friends for Thanksgiving, then you are no doubt stressing over all the food you have yet to make and how you’re going to fit everyone into your dining room. BlackJack offers a simple solution everyone will love: pizza! You don’t have to worry about cooking or even doing dishes if you don’t want to, and as we’ll discuss in a moment, the wide variety of BlackJack’s menu makes it easy to find something for all the picky eaters in your family. Cooking up a Thanksgiving feast is not for the faint of heart. According to the National Fire Protection Association, Turkey Day has a higher incidence rate of kitchen and home cooking fires than any other day of the year, and past years have seen thousands of emergency room visits across the country on this particular holiday. Put the deep fryer away and choose pizza for a safe, delicious alternative. Whether the turkey is still frozen solid, you’ve already turned the cranberry sauce into a gelatinous mess, or you’ve waited too long and there’s no way you’ll be able to cook everything in time, there is still one way to save the day: BlackJack pizza! We’re open until 10 p.m. the day before Thanksgiving in case everything goes terribly wrong – or you simply want a better way to celebrate – and you can call or use our mobile app to order! Come Thanksgiving day, you can simply place the pizza in the oven to warm up, and serve! The problem with having so many traditional foods for Thanksgiving is that all those with dietary restrictions and those who are just plain picky eaters can get left out. At BlackJack, we have something for everyone! Try our gluten-free crust or order a few “Naturals” for your vegetarian friends. You can even place a custom order with as many or as few toppings as you want. We also offer salads, chicken wings, drinks, and even desserts! You can find it all on our online menu, and bring home a feast that everyone will love. This Thanksgiving, take it easy, and let BlackJack in Loveland take care of all the cooking. It’s fast, easy, and a heck of a lot safer than firing up an electric carving knife for the first time. Whether you are hosting friends, family, or all of the above, they’ll be sure to love the selection of great food on our menu. Take a look and place your order today, before it’s too late!